The Walk-In-The-Water.....built in Black Rock, spurred Buffalo ambitions. The small group of citizens who overcame tremendous physical and economic obstacles to construct Buffalo's first harbor laid the foundations for this city's future greatness....Without them, Buffalo would have remained just another frontier village. 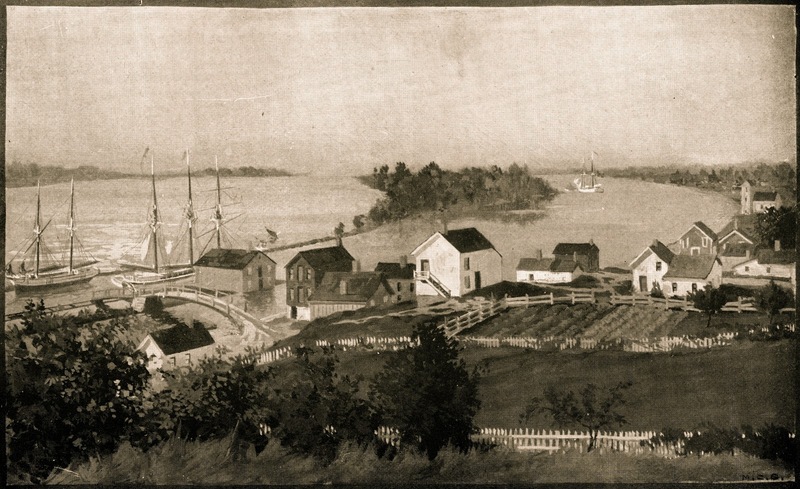 THE PLAN to Make the Village of Buffalo a great harbor city had its origins not only in the development of the Erie Canal but in a bitter commercial rivalry with the Village of Black Rock. The rivalry had existed almost from the time the two villages were founded. 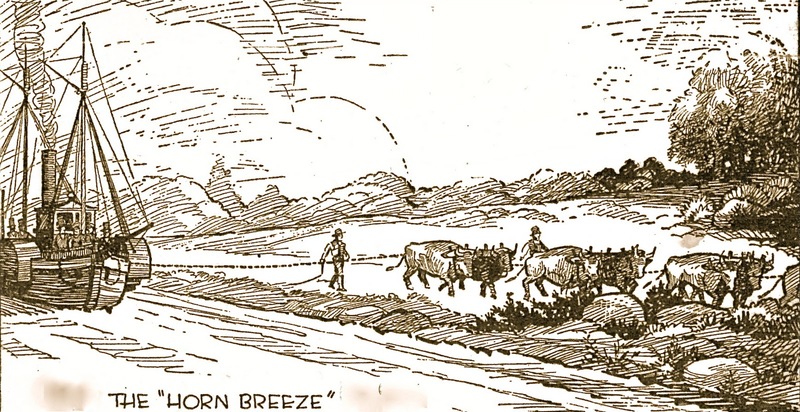 When Joseph Ellicott was commissioned by the Holland Land Company to lay out a village near Buffalo Creek, he saw at once that Black Rock had more natural advantages than Buffalo. Fearful that his work would be undone, Ellicott wrote in 1802 to Paul Busti, general agent of the company, urging that the lands at Buffalo be opened for sale immediately. Black Rock clearly "was equally or more advantageous for a town than Buffalo," he wrote, and Buffalo's opportunity might be lost if the land sales were delayed. The Holland Land Co. purchase did not extend to Black Rock and Ellicott could not carry his work that far. There is no doubt that, if he could, he would have laid out the Village of New Amsterdam, as he intended to call the community, near Tonawanda Creek instead of Buffalo Creek. Ellicott realized immediately Black-Rock had a natural harbor while the mouth of Buffalo Harbor was blocked by a sand bar which prevented all vessels but canoes from entering. This sand bar was for many years a tombstone on Buffalo's hopes. In dry weather it could be walked across. Even when rain was frequent, the water rarely rose higher than a man's waist. IN BLACK ROCK there were forces which made the rivalry more intense. 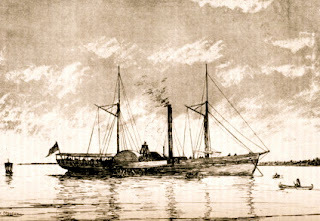 Peter B. Porter and his brother, Augustus, were making strenuous efforts to monopolize Black Rock's harbor facilities. Long before Buffalo could dream of such a venture, the Porter brothers were busy with shipbuilding and shipping. But Busti heeded Ellicott's plea and Buffalo began to grow. Still, there was no portent of the village's future in those early days. The eyes of early Buffalonians were turned more to the earth beneath their feet than to the water at their doorstep. It was natural this should be. The land around Buffalo was fair. From Lake Erie to the Genesee, pine grew in the ridges and hemlock in the valleys. Upon the plain, mile after mile, stood an unbroken stand of maple, oak and elm. But along Buffalo and Tonawanda Creeks, the land was swampy. In summer, thick swarms of mosquitos and flies rose from the water's edge. Just before the swamp, near the banks of the stream where the beginnings of Buffalo were to be made, were thick groves of basswoods. The prehistoric lake beach, of which the Terrace is now a part, was a stretch of treeless bluff overlooking the lake. Below the lake beach, along the easterly border of the Niagara River, was a succession of sand dunes. This was not a country to which harbor builders came. In spring it was the scent of bursting buds that carried on the wind, not the smells of water and ships. In October, the smell of wood smoke hung in the air, not the whirling of trade winds. In winter, part of the lake was frozen. There was no way to leave. Black Rock, proud of its reputation as a shipping center, busy and prosperous as a result of its role in the salt trade, which was the main commodity of commerce on the lakes at that time, shrugged off Buffalo's protestations of equality. It watched, almost with condescension, the reconstruction of the village the British had burned. While Buffalo struggled for sheer survival, Black Rock made plans for its future. But the idea of the Erie Canal grew. And with it the conviction of Buffalo's citizens that the western terminus of the canal must be located in Buffalo. This was to be the Phoenix springing from the ashes of burned Buffalo. Black Rock was a shrewd and resourceful opponent. Its men were working as vigorously as Buffalo's to gain the great prize of the canal. Letters were dispatched, wherever there were men to be influenced or policies to be decided, lobbyists for both sides were hard at work. In 1817 construction on the first portion of the canal got under way near Rome. It was expected that 10 years would elapse before the project was completed. But Black Rock didn't wait. Just one year after the first canal excavation was begun, Black Rock took a mighty step in its campaign to become the western terminus of the canal. A group of New York businessmen were persuaded to finance the building at Black Rock of the first steamer to be put afloat on the Great Lakes. It was a major effort and on the day the ship was launched in August of 1818, there was a civic celebration in Black Rock. 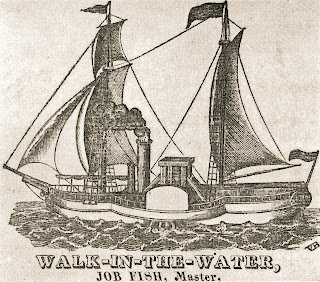 The steamship was called the Walk-In-The-Water, not only because of its sailing characteristics but in honor of a neighboring Wyandotte chief. It was built along the general lines of Robert Fulton's Clermont and used sails as well as steam. 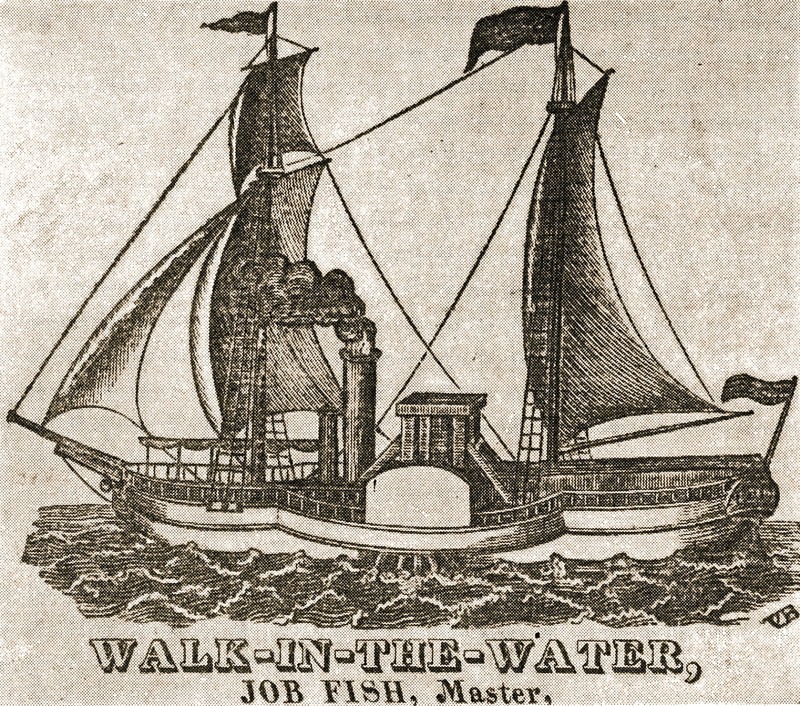 But instead of closing out Buffalo's claim as the logical terminus of the canal, the launching of the Walk-In-The-Water was fuel for the flames of Buffalo's ambition to overcome its old rival. Despite its steam boilers and sails; the Walk-In-The-Water could not breast the rapid current of the Niagara. The vessel was ready for use about the middle of August. Again and again it poured all its power into an attempt to steam upriver into the lake. Each time it fell back, its engines too weak to force the passage. After several days of this unavailing effort, the owners of the vessel swallowed their chagrin and asked Capt. 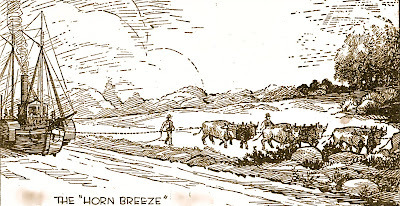 Sheldon Thompson of Black Rock for the loan of his celebrated "Horn Breeze," the ox teams which dragged sailing vessels against the current until they reached the relatively calmer waters of the lake. On Aug. 23, the final effort was made. The "Horn Breeze" was attached by cable to the ship and a pounding head of steam was built up in the vessel's boilers. The stokers flung wood into the fireplaces, the drivers cracked their bullwhips, the oxen strained against the line, and to the cheers of spectators and shouting of drivers and crew, the vessel finally moved upstream. Thus, with the aid of one of the most ancient motive powers, the age of the newest motive power was inaugurated on the lakes. BUT THE EXPERIENCE of the Walk-In-The-Water proved that if vessels were to use this end of the lake with regularity, a harbor would have to be built in Buffalo. Only thus would the time-consuming and expensive method of hauling the ships against the Niagara current be overcome. Samuel Wilkeson, a man who saw this city, at perhaps, its most degrading time in our history, had, along with three other resolute Buffalonians, recognized that Buffalo's fate, lie in its getting a harbor. A good harbor, would most certainly bring the termination of the Erie Canal to Buffalo.